Come To Enjoy The New Private Massage & Shower Room. 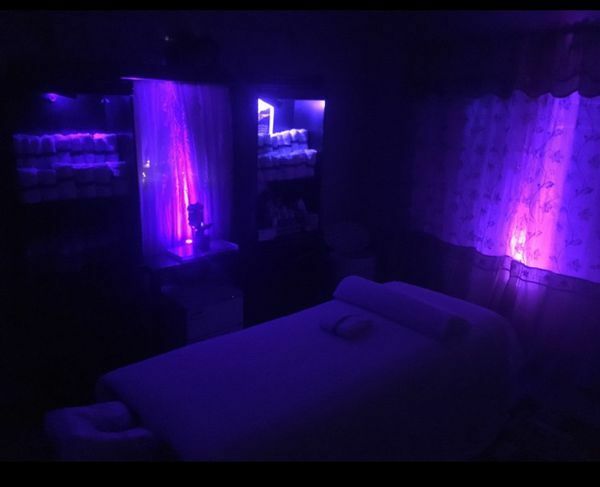 When you enter on my private Room Massage, you'll feel immediately at-ease and relaxed.i always have a dimly lit room ready with candles and soft relaxing music you can be ready to reduce stressed muscle tensions of the day.The Massage table are set up ready well. You will always find a new sheet thats clean and ready for your appointment..
My pressure is usually strong and firm. However...More , i am glad to also offer a wide range pressure. COME TO TRY MY MAGIC HANDS!!! Combination of different techniques. All Massage are on a Comfortable MASSAGE TABLE, With Essentials Oils or Unscented Oils. Body Lotions, Warm Towels, Hot Stone, Relaxing Music And Comfortable Atmosphere . Shower is Available For Your Convenience. Foot Scrub COMBO for 120 minutes or More. ASK FOR BODY GROOMING RATE. Come to Try The New Room. Tony offers a professional and talented Massage he’s a pleasure to visit and I always leave feeling relaxed and better than when I went in.you will enjoy your massage with Tony. My first massage appointment was scheduled with no challenges. Tony responded in a very timely manner and communicated very effectively to offer a time that would work for my schedule. On the day of the massage session, Tony greeted me with a smile and provided wonderful hospitality. His studio was very easy to find and it was very clean with amazing ambiance. I thoroughly enjoyed how observant he was in assessing my stressors. He used a variety of techniques that relieved all of my muscle aches and pains. He was firm in his technique, but very gentle. The music and dim lighting helped me to relax and to move into a space of comfort. I appreciate that he was very humble and enjoyed the work. He has a wonderful energy and understands body language and social cues. Thank you, Tony for being a wonderful masseur. I look forward to seeing you very soon for another rejuvenation massage therapy session. Be well. Tony provides a very complete full body massage. His pressure was consistent throughout the session. The foot scrub was a nice bonus. The standard rate includes what you would expect from a typical spa. First, it is so very easy to schedule a massage via text, my preferred contact method, and he is always willing to do everything he can to accommodate my schedule. Such pleasant and clear communication. Second, his studio is extremely relaxing and comfortable. It's immaculately clean with soothing lighting and music. But most importantly, the massage is simply incredible. Any area that needs special attention will be addressed, of course, but he has intuitive hands that leave me utterly relaxed every time. He uses a wide variety of techniques, each more satisfying than the last. I always leave feeling fantastic, and looking forward to my next visit! Excellent massages everytime. He is professional and friendly. Very clean and comfortable premises with soothing music, warm towels, and even hot stones . Highly recommend! Tony applied just the right pressure in my massage. He always finds the sore spots and rubs them away. He's nice & engaging every massage I've received from him. I have used Tony almost every two weeks, and he is by far the best masseur I've ever had. His massage room is top notch, he's very adept at relieving stress and making his customer feel alive again. His massage technique combines pressure with warm muscle relaxation which makes you want to just stay on the table forever. I have sent many friends to him and all become repeat customers.